Thanks, GVRD Board and Staff! Thank you, GVRD, for the wonderful way that you recognized and honored the Vallejo Watershed Alliance at your most recent Board meeting. Partnering with GVRD staff and board members allows the Alliance to accomplish many, many things. You are a terrific organization and tons of fun to work with! 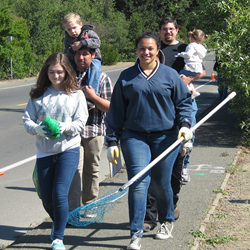 The Vallejo Watershed Alliance will host two activities in May.The first, a Cleanup of Rindler Creek, will take place on Saturday, May 17 from 9:00 a.m. to noon. We will meet at the corner of Fairgrounds Drive and Coach Lane and remove any trash that was washed into the creek during our brief rainy season. Wear closed toe shoes, sturdy clothes, hat, gloves and sunscreen. We’ll provide water, refreshments, and any needed tools. On Sunday, May 18, we’ll host a table at the Vallejo Garden Festival from 10:00 a.m. to 4:00 p.m. The festival will take place at Marin Street on the corner of Capitol Street. We hope you’ll stop on by to this fundraiser for the Vallejo Naval and Historical Museum. It’s a great event for a great cause!